New, but immediately recognisable. We all watch nature shows once in a while. 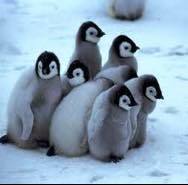 We know about the penguin huddle. Except I heard about it in a training seminar on suicide prevention. And we were talking about a whole different kind of cold. And I instantly thought of Riverfront. Because that’s one of the things we always want Riverfront to be – a warm place for cold penguins. A safe place, for all our kids. I’ve heard kids refer to our group as an island for misfit toys, too. I’ve heard and seen them acknowledge many times before that, for one reason or another, they haven’t felt comfortable, or safe, or accepted, or at home, in other groups and settings. I don’t think that’s unusual for any kids – finding a place to belong can be tricky – and I don’t think there’s anything uniquely awkward or difficult in the kids who join Riverfront, to be honest. But somehow, oddly, being people who “don’t fit in” – can become something they have in common, something that bonds them together from the outset. At Riverfront, the kids find a place to belong. They’re surrounded, embraced, accepted, and supported. That’s important – and something that we take seriously. We know we’ve been a place that’s changed things in the lives of hurting kids. We, as volunteers, usually have no particular specialities. We aren’t social workers, we aren’t psychologists. But we’ve seen lives changed, and we’ve seen kids come together and become a team. Our mandate is “…to provide all youth, regardless of ethnic, social or economic background, the opportunity to participate in a collaborative theatre experience. We offer a safe, accessible, open forum in which young people can express themselves…” – and it’s all tied to theatre. But it’s become increasingly clear to us over the past many seasons that theatre really is only part of what we do. We work hard to be a group that people love to come see for entertainment. And I think we do a terrific job with that. I will treasure the memories of the shows our kids have brought to the stage forever. But if I had to be strictly honest – I’m a lot more proud when I see us being a warm place for the cold penguins in our midst. Previous: Previous post: Our First Group Trip to Stratford! Next: Next post: Behind the Scenes in June!